Final Fantasy Adventure, released in 1991 for the Game Boy, was not actually a Final Fantasy (even though it had a Chocobo in it). It was the first game in the Mana series, renamed by Square’s US marketing team. This was followed by Secret of Mana, and believe it or not, FFA was just as good as SoM even with the graphical limitations of the Game Boy system. I loved it, personally, and I welcome any remake Square wants to create, though I’d prefer a rerelease of the original too. 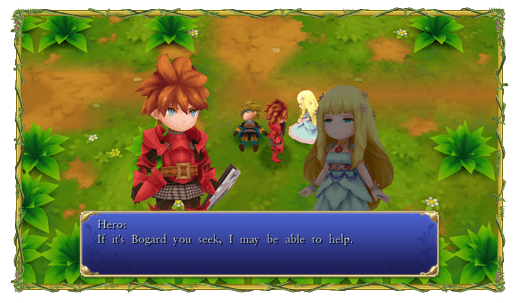 Square already remade this game in 2003 for the Game Boy Advance, renaming it Sword of Mana. It was only a loose adaption though and changed the game in a lot of ways. They’re about to do it again and this time they’ve named it Adventures of Mana. There has been no announcement of an English version, but today all doubt was removed when Square put up an English version of the site for the game, displaying what are clearly translated screenshots. That’s the good news — that we’re getting it — but the bad news is where. In Japan this game is being developed for mobile devices and the Vita. The English site, however, has no Playstation logo, implying the Western release might be on phones only. I tried to appeal to Square on hopes of changing their minds, but it didn’t go well. ME: Can I please have this game on a device I want to play games on, that uses buttons, and that I can save for generations? SQUARE: NO. Now eat your gruel! It’s reported that this remake will stick much closer to the original game than Sword of Mana did. I hope every poor sap who decided this is a phone game gets stuck at “Palm Trees and 8” forever.